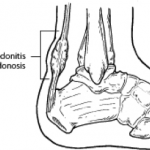 The Achilles tendon is the largest tendon in the body; connecting the calf muscles to the heel. An Achilles tendon rupture prevents the tendon from performing its function of pulling the foot and ankle downward during walking, running and jumping. Most ruptures occur about four to six inches above the heel, but the tendon can also tear where it meets the heel bone.